Being a total book loving family in our house we always love to add new bedtime stories to our collections. I'm also a big fan of personalised items so when Penwizard got in touch to see if Harlow would like to review their new Blaze and the Monster Machines book I couldn't resist. I'm sure a lot of you will be familiar with Blaze from nickelodeon, I know Harlow definitely is. She loves watching him zoom around with his monster machine pals and saving the day when Crusher goes out of his way to ruin it. 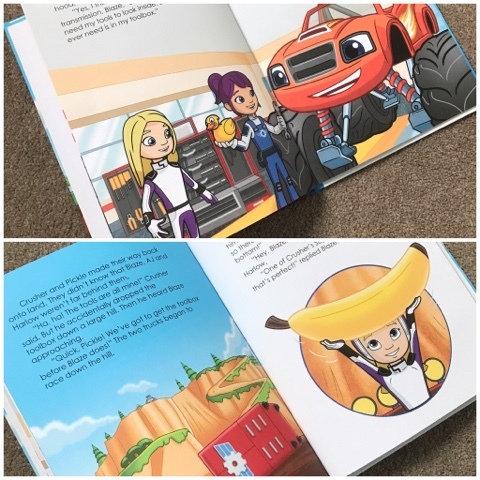 It's that reason why I couldn't wait to get my hands on this personalised story for her because not only does her name get added to the book but one of the characters in the book is personalised to look like her too! How amazing is that. So the book is actually called Harlow and Blaze Catch Crusher! since it's personalised. It will of course be your child's name instead of 'Harlow' when you personalise it online yourself. It's a brilliant story book where your child has decided to visit their best friends, Blaze and AJ. However, it wouldn't be a normal day in Axle City without something going terribly wrong! 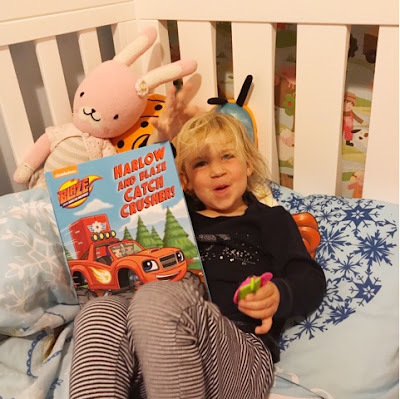 When Crusher sneakily steals Gabby's toolbox, it is up to your child, Blaze and their friends to catch Crusher and to save the day! Your child will be fully integrated in the storyline and illustrations. The illustrations are my favourite as there's so many ways to personalise which is great. As well as entering the child's name, (which will appear throughout the story and on the cover of the book), hometown and birthday, you can personalise the child's character to mirror their likeness. The character personalisation includes: skin tone, hair colour/style, eye colour, clothing colour and the option of glasses. It really is fantastic and can you imagine your little ones face when they see themselves in the story! There is also a wonderful option of leaving a personal message (up to 100 characters) which is printed on the first page, making this book a memorable keepsake to share with your child for years to come. Quite a nice option if you're giving this as a present too. Harlow received the large hardback copy of the book which retails for £19.99 but there's also the option of a softback for £14.99. You should have seen her wee face when she got her book she was so excited. I showed her all the illustrations of how she was actually in the book and also pointed out her name on each page. She was thrilled and couldn't wait for me to read it to her. We both loved the story and Harlow sat contently for me to read it to her. I think the fact she's in the story makes it better for her so she'll concentrate on it more than other stories. It was the perfect bedtime story to end a busy day. 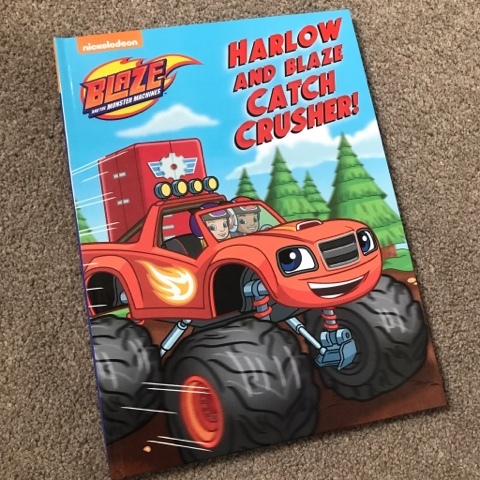 This book would honestly make the perfect gift for any Blaze and the Monster Machines fan and you can get 10% off your order with my code - BLAZE10. 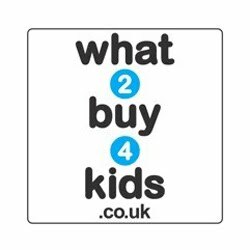 Just pop it in at the checkout and you're good to go. Happy shopping! 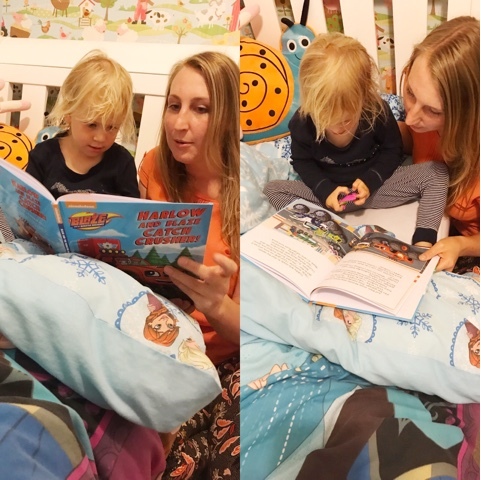 As well as this amazing discount I also have the chance for one lucky reader to win their very own copy of this fab personalised book for their little one. Simply enter via the rafflecopter widget below. Good luck! 17 comments on "Review & Giveaway: Penwizard Personalised Blaze & The Monster MachinesBook"
definitely Blaze is our little Grandson's Favourite. my little man absolutely loves Blaze byt zeg is a close second!! my grandson likes Blaze best!